Recently, Yann Ollivier developed a nice theory of Ricci curvature for Markov chains. In many ways, this can be seen as a geometric language giving another view on the notion of path coupling, developed at the end of the ‘s by Martin Dyer and co-workers. It has to be noted that this new notion of curvature is very general and does not need the state space where the Markov chain evolves to have any differential structure, as can be expected at first sight. Any state space endowed with a metric suffices. Let be a Markov kernel on a metric state space . We would like to quantify how long it takes for two different particles evolving according to the Markovian dynamic given by to meet. If the first particle starts at and the second at , the initial distance between them is . At time , what is the average distance between these two particles. For example, if and are two Brownian motions in started from and respectively, there is no reason why and should be closer from each other than and . Indeed, one can even show that whatever the coupling of these two Brownian motions we have : this is roughly speaking because the Euclidean space has no curvature. The situation is quite different if we were instead considering Brownian motions on a sphere: in this case, trajectories tend to coalesce. It is interesting to note that under mild conditions on the state space one can always find a coupling that achieves the infimum of (4): this is an easy compactness argument. The closer to is , the more the trajectories started at tend to meet the trajectories started at . In this case we say that the Markov kernel is positively curved on . It should be noted that in many natural spaces it suffices to ensure that for all neighbouring states and to ensure that for any pair . This can be proved thanks to the so called Gluing Lemma. A space without curvature correspond to the case : for example, a symmetric random walk on and a Brownian motion on have both zero curvature. The curvature is a property of both the metric space and the Markov kernel : indeed, different Markov chain on the same metric space have generally different associated curvature. Given a metric space carrying a probability distribution , this is an interesting problem to construct a -invariant Markov chain with the highest possible curvature . for every small enough. The quantity is the distribution of when started from in the sense that . 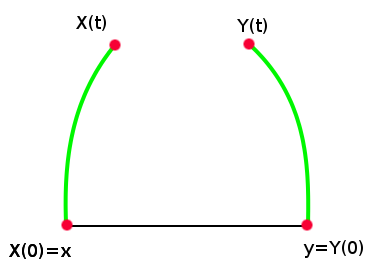 In other words, the higher the curvature, the faster the convergence to equilibrium. Let us give examples of positively curved Markov chains. In other words, the Langevin diffusion is positively curved with curvature (at least) equal to . In other words, the curvature of a Brownian motion on the unit sphere of is equal to . Maybe surprisingly, the higher the dimension, the faster the convergence to equilibrium. This is not so unreal if one notices that the Brownian increment satisfies . Other examples: see the original text for many other examples.